The 1918/7-S Standing Liberty Quarter Overdate is a Key. In 1918, the United States was in the midst of a wartime economy, and in support of this, production boomed at the nation’s minting facilities. At San Francisco, coinage of the Standing Liberty Quarter soared to more than 11 million pieces in 1918. It was the duty of the mother mint in Philadelphia to supply branch mints with coin stamping dies. Two hits from a master hub were required to form a coin die. In the push to maintain high coinage production, somehow a 1918 die was first hit by a 1917 master hub, but the second blow came from a 1918 hub, creating an “8 over 7” effect. Even though the overdate is visible to the naked eye, numismatists did not recognize the variety until 1937. By then, many of what most certainly a small number to begin with had been lost, or had the date worn off. The 1918/7-S Standing Liberty Quarter is rarer in higher grades than its 1916 sibling, and is acknowledged as one of the leading key dates in the popular Standing Liberty Quarter series. 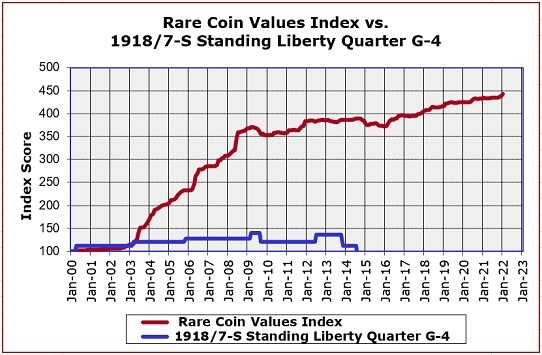 Coin collectors widely recognize the 1918/7-S Standing Liberty Quarter to be the key date in the Standing Liberty Quarter group, so the graph above causes some puzzlement. The blue line depicts the percent value change of the 1918/7-S in G-4 condition since the Year 2000, which is almost flat. Contrast this to the red line Rare Coin Values Index, which charts the composite percent change over the same time period of a pre-selected group of 87 rare US coins, the purpose of which is to understand the strength and direction of the overall rare US coin market. The 1918/7-S quarter is one of the 87 coins tracked as part of the Index. The performance in recent years of this rare coin in G-4 condtion has been out of character. Higher grades have done much better, however. The Rare Coin Values Index is updated monthly.